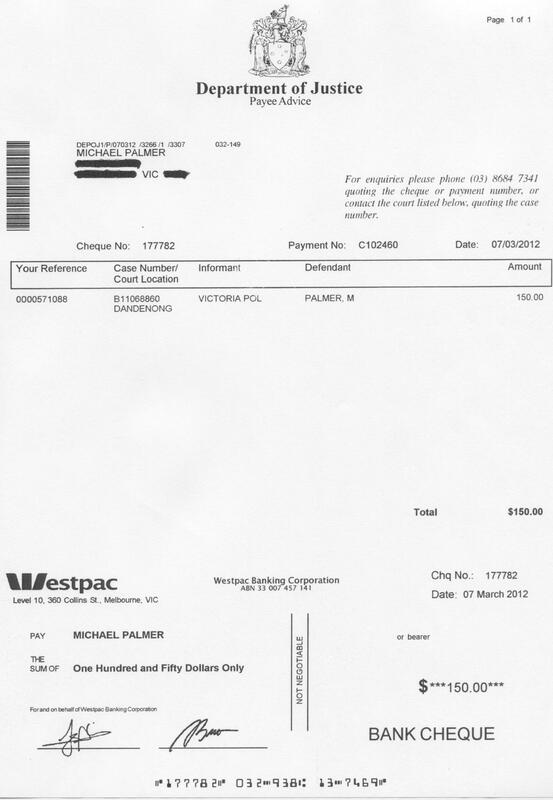 Mike Palmer, one of our founding Members and spokesperson has had another win against 2 parking fines! Following on from my e-mail to you the other week, I am writing to confirm the following details in respect of my recent win in the Melbourne Magistrate’s Court over two ridiculous parking fines issued by Melbourne City Council over 18 months ago. I took up the whole of courtroom 2 on the ground floor of the <?xml:namespace prefix = st1 ns = "urn:schemas-microsoft-com:office:smarttags" />Melbourne Magistrate’s Court in Victoria from 10am to 4pm on the 22nd of January for the hearing of Case Number C10728398. Your team and/or your members are welcome to look this up and confirm everything I include here. Melbourne City Council arrived with no less than a dozen people in tow and, at times, I would guess that there were up to 15 people in attendance, all to support the council and, I’m assuming, to try and put me off my game. I know for sure that the Prosectuor – older guy, don’t recall his name - was in attendance, as was a solicitor, Ms Kylie Walsh. Both were from Maddocks Lawyers and had no lawful right what-so-ever to be prosecuting a so-called “criminal” case. There were also 2 parking inspectors in attendance – a Mr Michael Janicke and a Mr Stuart Wallace – who I managed to keep off the streets for an entire day and ensure that they didn’t issue any unjust and unlawful fines to other motorists – at least for that day. And, as I understand it, there were 2 company Director’s a Mr Peter Crowhurst and a Mr Stephen Toal, as well as a Ms Kaye Estoesta. I say “as I understand it” because their evidence was never required but, of greater significance is the cost to the council of bringing these 3 highly paid “witnesses” – even though they didn’t actually “witness” anything – into court and paying them for an entire day of their time. I believe that there were another couple of people in attendance from the Melbourne City Council themselves but stand to be corrected on that point. In any event, I am estimating that I cost Melbourne City Council well in excess of $5,000 for the cost of these witnesses and the Maddocks Lawyers staff to run this case. I kept to parking officers off the street for a day and took up an entire Magistrate’s Court courtroom for a day as well. So, no matter what the outcome, I see that as a huge win, in and of itself. However, it gets better. As you will note from the attached affidavits and outlines of submission – which you are welcome to make available to your members – I raised pretty much every point I could in that case and the Prosecution had no answers at all. In fact, they were so stumped that the Magistrate spent half her time actually arguing with me on the points I raised. Now, hang on a minute, isn’t the Magistrate supposed to be an impartial adjudicator who is simply there to rule on the evidence presented to her – yeah right! Not surprisingly, she ignored most of the points I raised, gave incomplete or incorrect answers to the questions I asked and generally ignored all of the clear, irrefutable facts that I presented. About half way through the morning section, it was obvious that she was incapable of being fair and impartial and, not being concerned about the ultimate outcome anyway – given the cost the council had already incurred – I decided to twist things around to my advantage and benefit and now have, on the record, something that I will be of great value to you and your members. In short, the Magistrate was arguing that I could not rely on my affidavits as evidence unless I was prepared to get on the stand and be cross examined. Knowing from your e-book, as well as my own experience, how they like to twist things around on cross examination, I chose not to put myself in that position. Things got quite heated between myself and Magistrate and she told me flat out that every court in the land must allow the opposing party an opportunity to question any evidence that is to be tendered. Now, when I explained that would mean that every Infringements Court would be invalid because a fine is simply “rubber stamped” by a Registrar and the opposing party – being the motorist who was issued with the illegal Infringement Notice in the first place – is not given an opportunity to check, verify or cross examine that so-called evidence, she quickly changed the subject because she knew the ramifications of what had just been explained “on the record”. And, to that effect, I have also attached a copy of the transcript of that 5 minute section of my all day hearing. You and are members are welcome to read this and use it in any way that can assist. I would have loved to have been able to have the whole day’s proceedings transcribed but the cost is simply too prohibitive and I think my affidavits and my outlines of submissions clearly detail the arguments that I raised anyway. At the end of the day, this 5 minute section is all anyone needs to prove that any Infringements Court order is illegal and void as the defending party was not given a chance to cross examine or challenge the evidence provided by the prosecuting party – usually the police. In fact, what basically happens is that the police or the traffic camera office – or whatever they call themselves in each State – simply send paperwork to the “registrar” of a computer court and that paperwork is accepted as evidence without any checks or balances what-so-ever. Enforcement orders are then issued and this can even lead to warrants being issued or sanctions on people’s licences or registrations, all without any opportunity for the so-called “evidence” that led to those outcomes being checked at any point. Oh, and speaking of which, I ended up actually physically going into the so-called Infringements Court when I was in town and can also confirm that 15 of the 16 warrants that were illegally issued against one of my companies were also revoked as well. So, again, I’m sure many of your members will be happy you know that, even if they have left things very late and fines have gone right through the process where they have become warrants, they can still be challenged and defeated. I couldn’t believe how many people were in there when I went – I had to wait almost an hour to be seen – and all were holding letters from the Sheriff’s Office and 7 day notifications and similar threats of illegal action against them and I just wish I had some of your business cards on me to hand out. Don’t get me wrong, the best thing to do is to respond to fines straight away and object to them but, if for some reason, that isn’t possible or hasn’t happened, don’t give and pay the bastards, that just encourages them – even at the stage of warrants or sanctions, you can still fight them. There is simply no response to Section 8, Sub-section 12 of the Imperial Acts Application Act and that is what I used. Anyway, the long and short of the day was that the Magistrate couldn’t answer any of the questions I asked, she couldn’t respond to any of the issues I raised and she couldn’t refer me to any evidence from the Prosecution that I had done anything wrong or that the representatives from Maddocks Lawyers had any right to even bring the matter before the court. None-the-less, she still refused to actually dismiss the fines but also found no grounds for any conviction either. Then, on top of that, despite telling me how it was my lucky day that the prosecution didn’t ask for professional costs for prosecuting the case – I didn’t have the heart to point out that there can be no “professional costs” for a so-called “criminal” matter – she made an order that I pay $66 in costs for one fine and $22 costs for another. Yes, you read that correctly, it’s not a typo – a total of $88 in costs after taking up the whole courtroom for an entire day as well as a minimum of 12 people’s time and wages! Naturally, I asked that she “please direct me to the lawful and valuable consideration in circulation in circulation within the Commonwealth of Australia with which to discharge this debt to the State, giving full weight and regard to Section 115 of the Commonwealth of Australia Constitution Act 1900 (UK) and Sections 9, 11, 16 & 22 of the Currency Act 1965.” Not surprisingly, she had no idea what I was talking about and couldn’t get her head around the concept even when I explained it to her. Accordingly, her actual order isn’t worth the piece of paper it’s written on and they can’t do anything about it anyway. Having said that, I know that many of your members struggle with arguing the validity of court costs so, given that it’s no skin off my nose, I have appealed those orders and they will be dealt with in the County Court in April. I’ll touch base with you then and give you an update. As I’m sure you tell your members, the Commonwealth Constitution is the highest law in the land and every court must rule accordingly. Not only that but section 109 of the Commonwealth Constitution dictates that where there is a conflict between a law of the State and a law of the Commonwealth, the latter must prevail, therefore the Currency Act, being a law of the Commonwealth must also be considered before any order is made. This Magistrate doesn’t understand what she has done but she will do when my appeal is granted in the County Court. I have another little “ace up my sleeve” but will tell you about that another time. As always, please feel free to pass this onto your members, upload it to your website and/or use it in any way that will benefit as many people as possible. Copies of Mike's Affidavits, Outlines of Submissions and the transcript he refers to proving that all Infringements Courts are invalid are now all available via the "Member's Only info" page on our new Update Members area - http://www.membersonly.aussiespeedingfines.com/ - about half way down under the section entitled "About Parking Fines". Please note that there is a small annual fee for access to this area. If you have any questions or need further details in respect of the sign up process, please click here. Mike Palmer defeats unjust and unlawful Eastlink toll fine and is awarded costs in his favour! I trust this e-mail finds you all well. I just thought I’d share with you another BIG win that I had in court today that you might like to pass on. It all started out with a $1.79 Eastlink Toll Invoice and ended up with me not only having the case withdrawn against me but also being awarded $150 in costs – yep, I got almost 10 times back in costs what they were trying to originally sting me for! I used your info and combined it with a bit of my own knowledge and fought it for about 18 months but yesterday, the 2nd of December, I finally beat them and got costs awarded in my favour at the Dandenong Magistrate’s Court. You are welcome to look up the case, its number B11068860 and I encourage you to upload this e-mail to your website – I’m happy for you to include my name - because I know that people still have doubts about your information and I can assure them that it absolutely works and my day in court today is the perfect proof of that. You might also want to know that, I used your 3 step process, which they ignored; I elected to have the matter heard in court, which they also ignored; then had an Enforcement Order issued against me, which I applied to have revoked, which they also denied and it wasn’t until I got in front of a Magistrate that things started turning around in my favour. She took one look at the 60 page affidavit I prepared which raised all the issues about toll companies being private entities, the police not being able to prosecute over a civil debt, the Enforcement Order being illegal and void pursuant to section 8, sub-section 12 of the Imperial Acts Application Act etc and immediately granted my revocation application and suggested to the Prosecutor that they really didn’t want to pursue this case “did they”? And the rest, as outlined above, is history! So, tell your people that, no matter how much these “authorities” deny what you say and tell you you’ll never win, if you keep standing up for your rights, justice will prevail in the end! As always, thanks for all your tireless efforts keeping everyone informed of new breakthroughs and ways to fight these evil and corrupt revenue raising bastards! I hope this e-mail finds you well with many more Members who now know how to stand up for their rights. I am writing to you further to my e-mail of late last year where I not only beat a ridiculous Eastlink toll fine at the Dandenong Magistrate’s court but was also awarded costs in my favour. I know my last e-mail generated a bit of interest so I thought your Members might like to know that I have now finally received a cheque from the Department of Justice for my costs. As a quick reminder, the initial Eastlink toll was for $1.79 and gradually grew over the ensuing 12 months and, as you can see from the attached cheque, I was eventually awarded $150 in costs – almost 10 times the amount they were originally seeking from me! 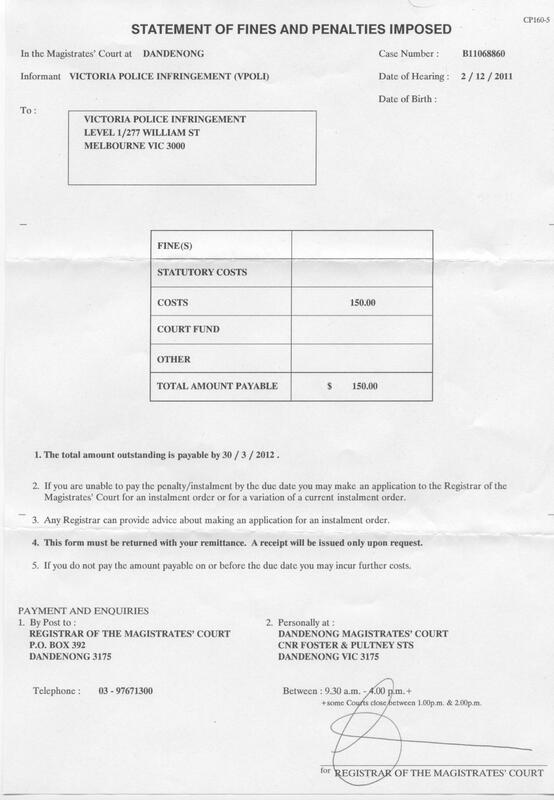 I have also attached a copy of the “Statement of Fines and Penalties Imposed” form that is addressed to the police and also has the Dandenong Magistrate’s Court Case Number at the top – B11068860. I know that you still have people who are sceptical about your info and/or your testimonials and can be negatively persuaded by crap that’s out on the internet trying to discredit you so this way, people can check everything I have provided and confirm it 100% for themselves. Also, if you guys or any of your members are interested in the affidavit material that I used in this case – to have it withdrawn and to have costs awarded in my favour – let me know and I’ll shoot a copy through. Anyway, as you know, I still use the ASF system and am constantly out there promoting your website at every opportunity. I have also adapted many of your strategies to many other legal injustices and am still fighting – after 4 long years – against the banks. I am getting very close to settling one of my cases now and have managed to help out a number of people who are at risk of losing their homes so, if any of your Members are in a situation like that, please let me know. Also, if you get a chance to mention the website again – www.savemike.com.au – that would be great, as many of your Members were kind enough to make very generous donations last time and it really helped me out a lot. I know you guys are always working long hours and often wonder if it’s all worth it so just to let you know that - at least from my point of view - it is very much appreciated, your info definitely works and, if any of my court experience can be of further assistance to you or your Members, please don’t hesitate to let me know. Please click here to download a copy of the notice of Fines and Penalties Imposed on the police in Mike's favour and please click here to download a copy of the payment advice and cheque he ultimately received to cover his costs. Wow, I didn't know there was so much interest in my case! I have been flooded with e-mails from people wanting copies of the affidavit I used in my toll fine case as well as very generous donations from your Members through the www.savemike.com.au site. Accordingly, I have attached a copy of not only the Affidavit that I used but, even more importantly, the Outline of Submissions that I provided the court with as well - which is what ultimately caused the court to immediately issue the revocation order and for the police to - within just 6 days - withdraw a matter that had been on-going for some 16 months, at that point. As you would no doubt know, most people would be happy just having the charge against them withdrawn but I believe that we have a duty to pursue costs against these agencies so that they learn their lesson to stop pursuing these ridiculous and unlawful fines. I would ask you to urge all your Members to do the same and, not only fight their fines but to pursue costs against these agencies as well because, that way, they will soon learn that the motorists of this country are waking up to their scam and will not put up with it any longer. 1. My correspondence of the 15th of September - that I served with my Affidavit and Outline of Submissions - which details why they could not proceed with the matter and why they had to pay my costs. 3. My correspondence of 22 September, detailing again why they had to pay me my costs before they were entitled to withdraw the matter. You will note that in my letter of 22 September I was, at that stage, only requesting $125 in costs however, they ignored that and ultimately had to pay me $150 in costs instead for their stubbornness. As always, I hope some of this helps to bring further credibility to your brilliant information and strategies and I hope that my court victory in some way helps inspire others to fight back against their fines too.